I’ve been told that executives at Google and Facebook dismiss the term duopoly as a marketing gimmick invented by publishers to go after the two companies. They are dead wrong. This discussion didn’t surface in some public relations brainstorming meeting. Sure, it’s useful if you can describe an entire marketplace in one word. But at the end of the day, the duopoly label resulted from simple number crunching, the results of which challenged conventional wisdom on who was actually benefiting from the growth in digital advertising. Perhaps now is a good time to dig deeper and take a closer look at some Google math. A whopping 50% of the US Digital Advertising Market is recorded as a single line in Google’s financials, deftly titled “Google Properties Revenues.” This single line includes advertising on Google Search, YouTube, Gmail, Google Shopping and more and will surpass $100 billion this year – a number larger than the entire US digital advertising market. Let that sink in for a moment and then consider the fact that we hardly know anything else about it. While fledging and century-old publishers live and die in the millions of revenues, Google doesn’t even specifically disclose revenues for its flagship growth site, YouTube. Their video business, which seeks to compete with broadcast television, is widely estimated to have revenues approaching $10 billion — a number larger than more than half of the companies in the S&P 500. Last week Bloomberg reported that the SEC had taken issue with Google’s lack of transparency but was sent packing after Google made the astounding claim that YouTube revenues aren’t important enough to hit their CEO’s desk. Say what now? There is also near zero transparency in how this revenue is shared with the ecosystem. In the case of major cable companies, we know very clearly how much they pay each year, measured in the tens of billions, to the programmers who create valued news and entertainment for their services. This is helpful information, and revenue. Transparency is a hallmark of a healthy ecosystem. On the other hand, we have no idea how much Google spends on news and entertainment because they bury this programming expense in multiple places. In terms of YouTube, we’re left to run our own analysis and we only know the members of DCN see less than $100 million of the billions that YouTube is raking in. We also know that Google is using billions in cash to shore up its monopolies. Google invests heavily to secure the default position over any browser that competes with its “free” web browser, Chrome, including Apple Safari and Mozilla Firefox. It subsidizes its lock on a majority of mobile devices through its “free” operating system, Android. We also know that billions go toward populating the long-tail of the web with Google’s AdSense text links. Once again, all of this undisclosed money is lumped together and buried in a few lines of Google’s financials. This leaves everyone in the dark while making it easy for Google to spin its way around those who question it – in Washington and in the press. Heck, we even learned that Google pays off ad blockers to whitelist its own ads. But once again: We don’t know how much. This is a distasteful situation considering the leadership position Google has chosen in the future of solutions for ad blocking. Google is literally blocking publishers’ ads while paying an undisclosed amount to have its own ads whitelisted. Say what now? Numbers don’t lie. The simple, irrefutable (and unacceptable) fact is that the digital advertising landscape is more lopsided in favor of two companies than we’ve seen in any previous media market. This is especially striking when you recognize that neither of these companies contributes directly to the creation of the news and entertainment they so richly capitalize upon. They profit solely by directing and mining attention across the valuable assets others create. Please note I haven’t used the term Alphabet once here. To publishers, their layered corporate structure isn’t anything more than Google fighting tooth and nail to avoid disclosures. If Google and Facebook want to be seen as benefactors to the media world — or better yet, become honest, trustworthy partners in it — they’re going to need to provide a level of transparency that they’ve quite clearly avoided. We’ve entered the perfect storm. The press worked itself into a flurry last week about missed projections, mergers, acquisitions, staff reductions, doors closing, and political influence across its own industry. Amidst this activity, there is real momentum and honest discussion of the challenges in building a sustainable 21st century digital news and entertainment business. And there is opportunity knocking. Newly compiled DCN member research shows early signs of marketer investment moving upstream towards quality content with sequential quarterly revenue growth for DCN members. News and entertainment companies are transforming into truly diversified revenue machines that are less dependent on advertising. More importantly, DCN’s “duopoly” analysis continues to reach wider circles of influence (and understanding) with reporters, think tanks, academics, and lawmakers now asking tough questions of both Google and Facebook. Therefore, it’s puzzling to see these two companies operating with blinders on as we watch their reactions to inquiries from the press, partners, and lawmakers. It should offend us all that, despite gob- smacking earnings this month, Google is attempting to double-down on its argument that their platforms are merely weather-machines innocently reading data rather than a major source of the media storm itself. In a speech last week to the Society of Editors’ at The Tamburlaine Hotel in Cambridge, Ronan Harris, Managing Director of Google UK and Ireland, fed decade-old Google arguments into the winds, despite the current media climate. While acknowledging that, “the open internet has turned business models on their heads and raised all kinds of new questions and challenges for us all,” Harris systematically tried to distance Google from any negative affect and control over the demise of news media and its societal consequences. By opening his talk on the uniqueness of the company’s role, Harris makes his Google-eyed perspective clear with the company’s classic “But we’re a search company” retort to any attempt to hold them to the standards to which responsible media companies gladly adhere. However, this particular PR rhetoric is far from the most egregious that Harris wove into his talk. As the UK’s News Media Association observed, my visceral response to some of Harris’ points—which I first expressed on Twitter—was that he was trying to reshape the escalating duopoly narrative. You have to wonder if he’s being willfully ignorant or overtly resistant to the discussion happening in every corner of our industry. Huh. Let’s break that down, shall we? This notion of an internet advertising duopoly is not based solely on Google and Facebook’s shared and growing dominance of digital advertising. Rather, it considers that the two share a core business model that leverages “free services” that collect inordinate amounts of consumer data in order to micro-target advertising at a massive scale. Importantly, Google and Facebook suggest that because their services are free, they can’t commit consumer harm. They do this by using the Chicago School of antitrust theory out of the 70s and 80s, which is now being questioned as competition law experts attempt to consider these issues in the context of our 21st century world. This is already something the European Commission is addressing in its fines of Google. And just last week, multiple Attorney Generals joined in Europe’s concerns. Regardless of your view on antitrust law, the point is that Google and Facebook have the same business model and their dominance begets more dominance. Another shared trait between the duopolists is that much of the information that they are able to collect about consumers is based upon the content that they discover on these services. As any premium publisher can attest, you learn a lot from audiences by what they choose to read, watch, and share. But that’s something Google knows all too well. This is a company that owns 96% of the mobile search market and 67% of search overall. Harris crowed about driving “more than 10 billion clicks a month to publisher websites — for free — from Google Search and Google News.” But the reality is that search—as a concept, much less as Google’s foundational business—would not exist without publisher content. Harris also claims that analysis of Google’s dominance in digital advertising “conflates two markets: search and display.” The majority of Google’s revenue comes from showing highly relevant ads when you search for a particular term.” In fact, in this way, search and display are not actually that different. Both target direct marketing ads based on data collection. This is what most of digital advertising is transacted on. And as we know, Facebook and Google are empires fueled by data, so this statement is more than disingenuous. It is absurd. Harris points to the lack of advertising on “Google News” as a clear sign that Google isn’t trying to compete directly with publisher’s hard-wrought news business. The fact there is a “Google News” vertical is something most people outside of industry don’t even understand. People are searching for and discovering news and information through many Google sites and channels (including YouTube and general search) where Google drives significant revenue—and data. Even though there aren’t traditional ads on Google News pages they are most certainly still monetizing that area of their business. 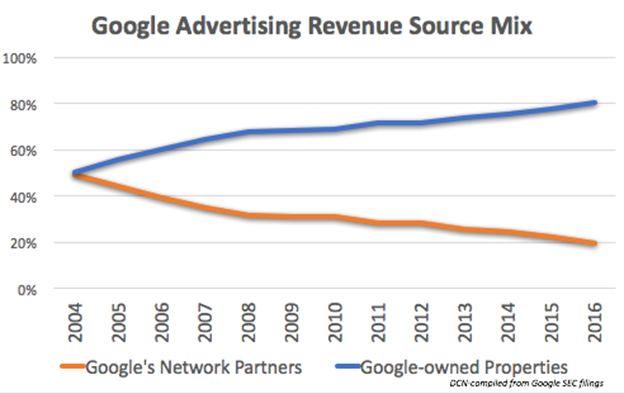 Additionally, over the past five years, Google’s own revenue mix has migrated from Google’s network of publishers (where they have the lowest margins and includes their AdSense text ads and DoubleClick ads which serve across the web) to Google’s owned and operated businesses (where they have highest margins and includes sites such as Gmail, YouTube and Search). Google controls this effect. And here’s part of Google’s business model that Harris didn’t cover: ad blocking. The fact is that many EU pubs lose more than 30% of their site advertisements to ad blocking software which significantly impacts publisher revenues and the ability to pay for newsroom jobs. Google’s recent decision to include an ad blocker in its own browser is not the biggest issue here. Google has admitted to subsidizing major ad blockers in order to service the “whitelisting” of Google’s own ads. Let’s be clear: Google is paying companies that develop ad blocking software. Meanwhile, Google is also the dominant company in discovery, distribution, and delivery of ad blocking software. While the rest of the industry is bludgeoned by ad blockers, Google’s payments protect what is likely billions of its own revenues on its highest margin products from the effects of ad blocking yet they refuse to disclose the details of these deals. That speaks volumes about the company’s priorities and tactics. Is this the behavior of a company that genuinely cares about the future of the media business? Harris claims that Google wants “to act thoughtfully and responsibly in our relationship” with the media industry. I can unequivocally state that transparency here would go a long way. I don’t disagree with every point that Harris made. As he said, “as more and more people interact with news in different ways, we need to take advantage of new digital tools and capabilities to develop new experiences and sustainable business models.” Believe me, digital media executives are thinking about this every single day. And while Harris claims that we’re misunderstanding who they are and what they do, I think we actually have a pretty good idea how they are making money and where publisher content fits into the mix. We get it, Google: You hire really smart people to create your products and your PR pitches. But don’t think that means we’ve lost sight of the value of premium content and the fact that we should be able to sufficiently monetize it in order to continue to support the journalism Google purports such esteem for and derives so much revenue from. It’s been a full year since DCN sent a letter to Google and Facebook asking for moonshots to better serve the news industry. Facebook spent a full year dodging tough questions while at times demonstrating signs of early self-awareness of the problem. Google, on the other hand, has acted like a monopoly with its much more advanced lobbying machine. The fact Google is turning up its spin in the UK and putting Facebook out front to take the shrapnel in Washington should concern us all. It certainly concerns me. 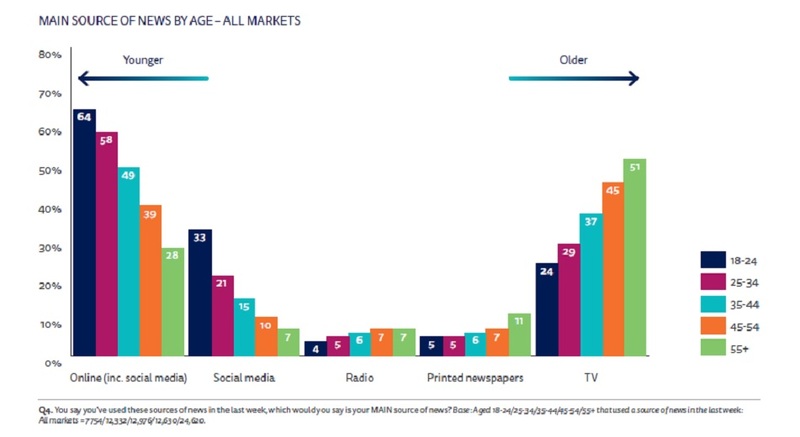 Most adults today use a combination of different sources and platforms to get their news reports the Reuters Institute Digital News Report 2017. The global report is based on a survey of more than 70,000 people in 36 markets, with added qualitative research in many of the countries. Social media is a big part of this media mix, as are TV, websites and apps. In fact, two-thirds of social media news users in the United States also watch television news (67%) and two-thirds also visit mainstream websites or apps (66%). Further, only a quarter (24%) of the respondents think social media does a good job in separating fact from fiction, compared to 40% for the news media. News brands struggle with their branding on distributed and social platforms. Reuters tracked over 2,000 respondents in the UK to see if they could remember their path to a news story found on Facebook, Google, or others. Only 37% of respondents could recall the name of the news brand when coming from search and 47% when coming from social. Trust in the news media varies greatly across countries. According to the report, less than half the population (43%) trust the news media. Trust in the news is highest in Finland (62%) and lowest in Greece and South Korea (23% each). There appears to be a strong correlation between consumer distrust in the media and perceived political bias, especially in countries with high political polarity like the U.S where trust in the news media registers at 38%. The news also appears to be impacting the consumers’ emotional psyche. 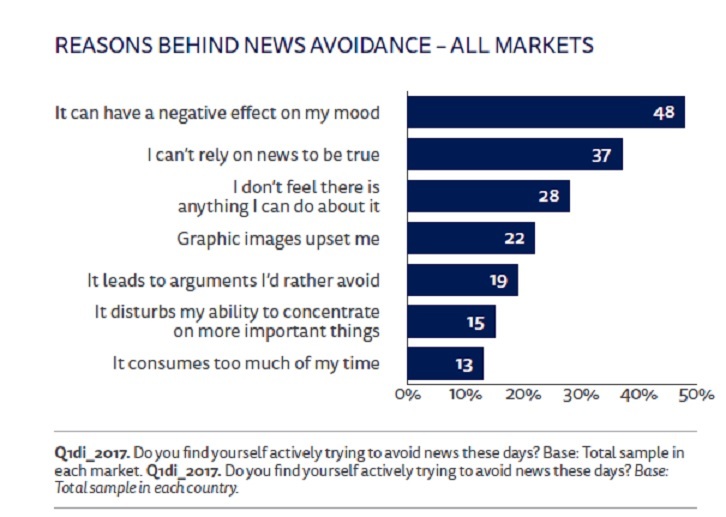 Close to a third of respondents (29%) state they often or sometimes avoid the news. Many say the news negatively impacts their mood and heightens concern over their inability to rely on the news to be true. Outside the U.S. and UK, growth in social media for news is leveling off many markets. In its place, messaging apps that are more private and do not algorithmically filter content are gaining in popularity. 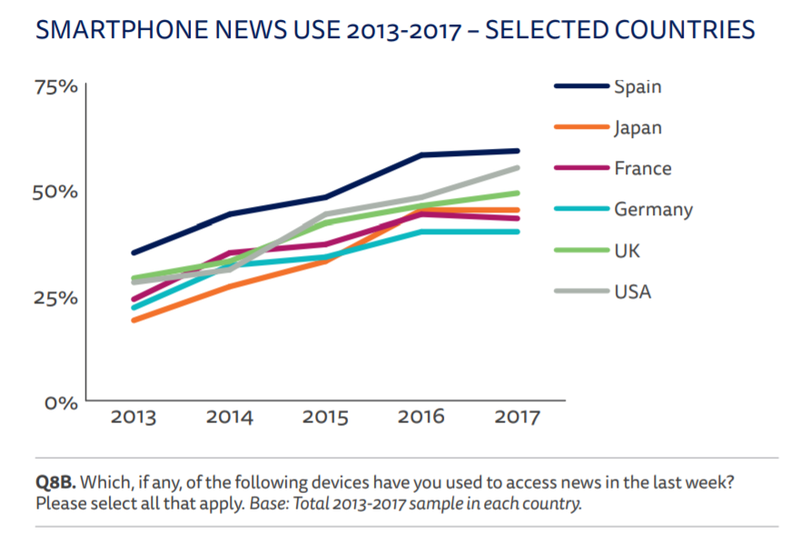 Mobile access for news is increasing in many countries. Mobile news notifications have grown significantly in the last year, especially in the US (+8 percentage points), South Korea (+7), and Australia (+4). This has many news publishers working with third party distribution like Facebook Instant Articles and Google AMP for quick efficiencies for content loading on mobile devices. Mobile news aggregators show usage growth, notably Apple News, and Snapchat Discover for younger audiences. Both have doubled YoY usage with their target audience. Smartphones are now as important for news inside the home as outside with 46% of consumers using their smartphones to access news in bed. Voice-activated digital assistants like the Amazon Echo are emerging as a new platform for news, outpacing smart watches in the US and UK. Overall, YoY growth of digital news subscriptions across all demos, especially among those under 35 years old. Specifically, online news subscriptions in the U.S. grew from 9 to 16% subscriptions. Across all countries, approximately one in ten consumers (13%) pay for online news. 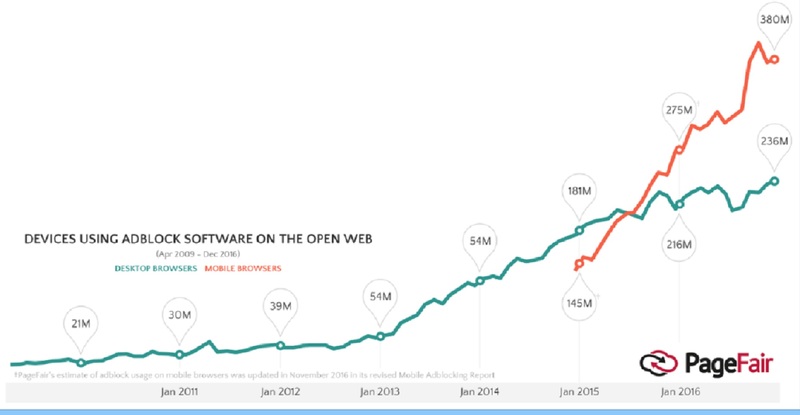 Ad-blocking growth has leveled off on desktop at 21% overall and is only 7% on smartphones. Interestingly, in some countries, more than half state they have temporarily disabled their ad-blocker for news in countries like Poland and Denmark (57% each) and the United States (52%). Melissa Bell, Publisher and co-founder, Vox Media comments on this analysis “if we work to rebuild trust with our audiences, we may find our way to more stable, significant businesses.” She’s identify a few key questions for publishers to think about and address as they continue to provide quality news content across platforms. What is currently not being offered to audiences? How can content appear essential to them? Can the sense of community be recreated for audiences around the country – or the world? How do publishers help audiences seek knowledge instead of simply publishing information? How can publishers help audiences feel less anxious with today’s news content? Importantly, publishers need to solve problems for their audiences. Digital news publishers’ focus on quality, transparency, and accountability will allow audience trust and engagement to follow. When Apple announced last year that it would offer mobile ad blocking on iOS 9, and Google stated it would crack down on interstitial ads on mobile websites, publishers went immediately to sky-is-falling mode, predicting that these moves would undermine their chances for mobile ad revenues. But so far the panic has been overblown, especially in the U.S.
What appears to be a burgeoning trend in Asia is still in its infancy here. This gives publishers a bit of time to readjust their advertising formats to meet consumers halfway. That said, Google, with its own vested interests, has just announced a new offering that will definitely push publishers: A new ad blocker. Thetech giant prefers to call an “ad filter” which will be integrated into its widely popular Chrome browser. It’s a move that’s likely to shake the entire advertising industry. Then again, it may just help to thwart the dreaded rise of further third-party ad blockers. But Apple announced its own Safari ad-blocker in the new High Sierra operating system for desktops. This one would block auto-play videos as well as ad tracking across the Internet. While Google is taking a more collaborative approach with publishers, Apple is “taking a harder line,” as Undertone’s Eric Franchi told Adweek. The 2016 report from Pageview, a company in the business of trying to get publishers to reevaluate their advertising models, caused a stir among some circles for its analysis of global ad blocking. Ad blocking increased by 30% last year. And among the 615 million devices blocking ads, more than half — 308 million, to be precise — were blocking on mobile. Taken in another light, that’s 16% of all smartphone users in the entire world. Yet 94% of all that mobile ad blocking took place in the Asia-Pacific region — in countries where Internet penetration is increasingly mobile-first, and where data prices are too high for most users to want to tolerate video and other data-heavy ads. North America and Europe, meanwhile, were much calmer in comparison, no doubt thanks to more affordable data packages. In India, mobile ad blocking is at 28%, whereas desktop ad blocking is a mere one percent. In Indonesia, 58% of users block on mobile, while just 8% do so on desktop. In the U.S., one percent of users block on mobile, whereas 18% do so on desktop. In the U.K., content compensation platform Sourcepointreports ad blocking is at about 18%. The figure is slightly higher in France and Germany. However, data suggests that these rates are stabilizing due to more effective communication between users and publishers. It’s pretty obvious why ad blocking on mobile is increasing: Users don’t like the ad experience, and publishers aren’t effectively communicating to readers about why their use of an ad blocker is detrimental to their business. A fair number of users don’t want to see ads at all. However, users aren’t simply hating on the content of ads. Among the reasons people chose to use an ad blocker were privacy concerns and irritation at interruptions. Users who block ads tend to be highly educated and aware of the ecosystem they’re involved in. That being said, of course publishers feel threatened. The West may be slow to block on mobile, but the world’s next billion Internet users are going to be mobile-first. Still, it’s not an apocalypse. In the current climate, publishers need to be more transparent to users about what’s at stake — and how they can make a difference. In an environment like this, it’s no surprise Google has announced what it’s hinted at for some time: A new ad blocker for its Chrome browser. The new browser will create a higher bar for the kinds of ads that appear on the web by filtering out the more annoying ones, like auto-playing video ads. The goal of the blocker, which is slated to come out in 2018, is to create a better user experience. The Coalition for Better Ads, an industry group Google belongs to, is creating the standard for permissible ads. The tech giant is signaling its collaborative intent by giving publishers six months to prepare for the ad blocker’s release, and to adjust their advertisements accordingly. It will then essentially grade publishers on the kind of advertising they’re offering. Google is also launching a feature called “funding choices.” This will let publishers charge users per page view if they’re already using an ad blocker. While it’s discomforting that Google and Apple wield such dominance, the companies are at least taking leadership positions where others haven’t. And they’re doing so while mobile ad blocking is still on peoples’ minds, but before it’s become unstoppable. The time is right for publishers to get their advertising house in order. Streaming online content continues to grow as social media and over-the-top services appeal to more consumers, especially to Millennials and Gen Z audiences. 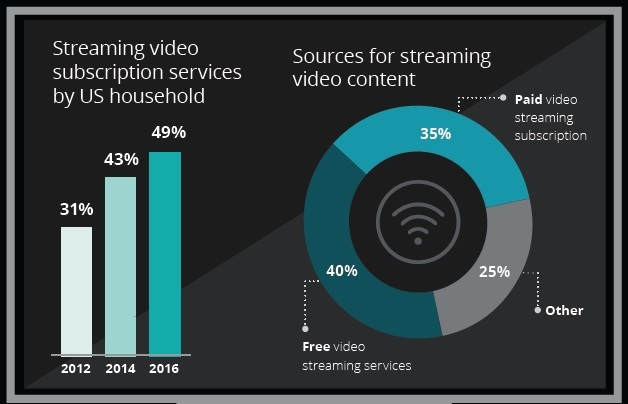 In fact, almost half (49%) of all US consumers now subscribe to a paid streaming video services with almost 60% penetration among Gen X, Millennials and Gen Z.
Interestingly, cable and satellite subscriptions remain steady at 74% of US Households. This can likely be attributed to pay TV subscriptions bundled with Internet services. US consumer media habits are shifting significantly. To better understand these changes, Deloitte’s Digital Democracy Survey offers insight into the multi-generational view of consumer technology, media, and telecom trends. Binge watching becomes the new norm. Close to three quarters (73%) of US consumers report binge watching. Nearly nine in 10 Millennials and Gen Z say they binge watch video content. Deloitte defines binge watching as viewing at least three or more episodes in one session. It’s time for marketers and content produces to think differently about reaching the binge-watching audiences. An advertiser may want to try product placements in a series for added frequency. Content producers may want to think about new distribution strategies such as releasing content as a bingeable mini-series instead of offering a feature-length movie. Of the content streamed, paid streamed content comprises 35% of consumers streaming time and free services take up 40% of stream time. Social recommendations are proving more influential than TV ads. More than a quarter (27%) of Gen Z consumers report that an online recommendation from someone within their social media circles can highly influence a buying decision. This can be more impactful than TV ads (18%). Advertising struggles for attention. When the TV is turned on, it competes with everything for attention. 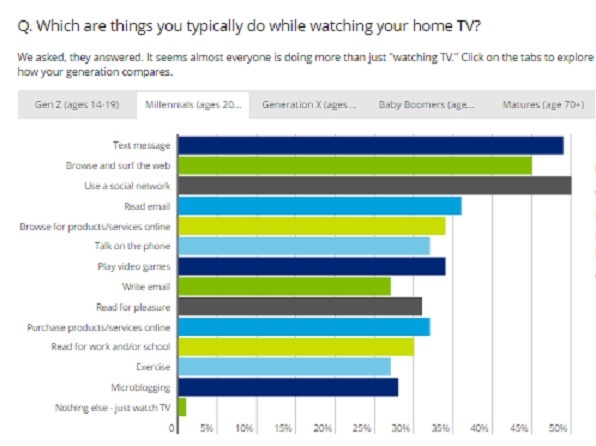 Nearly all Gen Z and Millennials (99%) report multitasking when they are watching television reporting an average of four other activities occurring simultaneously. Further, eight in 10 (80%) consumers’ report skipping online video ads when allowed, and just over two-thirds (67%) of consumers report mobile ads on theirs phone are irrelevant. Digital ad avoidance is growing. Almost half (45%) of Millennials use ad blocking software on desktop. Forty percent report using it on their smartphones with 85% doing so to improve the speed and performance of their online experience. Relevant and optional are key to engaging ads. More than half of all consumers say that they would be willing to receive geographically relevant ads on their smartphones. Further, nearly half (46%) of consumers say they pay more attention to an ad they can skip versus an ad they cannot skip. Social media usage is ubiquitous. A full 84% of all consumers are active on social networks. Penetration is higher among Millennials (96%) and 93% Gen Z (93%). Social media helps in connecting consumers to companies. Consumers interact with corporations, with more than 70% of Millennials reporting that they used social media to interact with customer service in the last year. Nearly three-quarters (74%) of Millennials find their interaction with customer service on social media more positive than connecting with customer service on the phone (70%). Consumers are now conditioned to watch content whenever, wherever, and on whatever device they choose. The constant availability of streaming content and social media offer new opportunities in the marketplace. Advertisers and content creators can form new relationships with the consumer, interacting with and personalizing the consumer experience. Leveraging what is likely the most comprehensive consumer study of its kind, this week The Coalition for Better Ads (CBA) took a meaningful step toward potentially improving both consumer and advertising experiences in the desktop and mobile spaces with the release of its ‘Initial’ Better Ads Standards guidance. Capturing the voice of the customer is absolutely critical in driving efficacy in advertising and consumer experience. This study very practically puts the industry on notice that invasive, disruptive, distracting and annoying ad formats must change. TrustX will use findings like these to continue drive change and support new ad standards benefiting consumers, marketers and premium publishers. The CBA collected ad preferences data from 25,000 internet users in North America and Europe. Not surprisingly, they identified a bevy (four on desktop and eight on mobile, to be exact) of “least-preferred” ad experiences falling below basic thresholds of acceptability. Ad experiences that are not only driving practices like the adoption of ad-blocking technologies, but adversely impacting perceptions of publisher content and brand experiences. The results of the Coalition’s consumer-focused research define Better Ads Standards that identify the ad experiences that fall beneath a threshold of consumer acceptability. Download a PDF of the CBA’s ad gallery here. About a year ago, Josh Benton of Harvard’s Nieman Journalism Lab asked me how concerned I was about ad blocking on a scale of 1-10. I answered “eight or nine.” And one year later, the situation has not improved: As of today it’s still a nine. In the spirit of transparency, I thought the time was right to look at where we are in terms of ad blocking, if for no other reason than I don’t want my silence on the topic to suggest that the issue is less dire than it was during the flurry of discussion around it in 2015. Since then, DCN has conducted research on the ad blocking ecosystem – some of which has been released only to our member companies. We have also posed many questions about Google, the ad tech ecosystem and the actual flow of the monies. Unfortunately, the ecosystem remains every bit as murky. The ambitions and fate of those profiting and suffering from ad blocking (including Google) have not yet been fully revealed. But one thing is crystal clear: The companies that create original content are being hurt the most by ad blocking because it prevents them from monetizing the audiences they attract. And the two companies, now known as the “duopoly” are likely hurt the least. As predicted, the adoption of ad blockers continues to grow linearly according to PageFair’s latest Ad Block Report. While the sky is not falling, the U.S. desktop penetration did grow from 15% to 18% last year and this number matters … a lot. Despite this growth, the IAB oddly recently claimed victory over ad blockers “rendering them toothless” and suggesting the risk of “network-level ad-blocking has virtually disappeared.” This kind of thinking is where things get dangerous. We have won neither the battle nor the war. In fact, PageFair’s report—which we have every reason to believe—clearly points to the contrary. Frankly, it’s for this reason that I’m writing now in parallel to our continued participation and support with other organizations on the new Coalition for Better Ads. The companies in the ad tech ecosystem—where many of the ad blocking issues are forged—have very little incentive to be concerned about ad blocking. Their collective migration to the latest ad tech craze, header bidding, has increased their inventory and revenue access by an order of magnitude. It’s also widely recognized to have increased latency, data leakage and other vulnerabilities. So potentially good for revenues, arguably bad for consumers. The additional inventory dwarfs any modest increase in ad blocking so the ad tech companies’ incentives are in many ways at odds with consumers and content creators. Consumers are shifting to mobile, where ad blocking penetration is estimated at an immaterial 1% in the U.S. However, the value proposition of a mobile ad blocker is significantly higher (heightened concerns for security, user experience, data charges, privacy). So it’s risky to expect penetration to stay at 1% given that it’s currently 60% in parts of Asia, where ad blocking is built into the browser. The same functionality is already available in the States (through the Brave and Opera browsers). And not incidentally: In China, mobile users know how to change the proxy servers on their phones, so I’d expect Generation Z may soon be doing the same, in droves. And this is just one of the numerous ways in which ad blocking may rapidly impact mobile apps. Network-level ad blocking concerns will likely grow. The number one goal of the new administration’s FCC is to throw out the net neutrality rules. Yes, there is a rational argument against the current regulation. However, nearly 100% of the public wants something in place that protects the neutrality of the Internet against blocking, throttling and other nefarious practices. I’m pretty sure it is not a good idea to fight the Internet. To the point of ad blocking, if the FCC rules are thrown out and not properly replaced by Congress, there is nothing to prevent a carrier (why hello there T-Mobile!) from launching its own ad blocking plan. Meanwhile, the most powerful trade bodies in our industry have yet to take a stand in support of net neutrality (other than DCN, which is not conflicted on the issue). The financial impact of ad blocking trails its penetration mostly because advertising supply greatly outweighs demand. As long as there is considerably more desktop inventory than demand, then the financial impact is mitigated. But what happens when it doesn’t? Privacy continues to be the third rail in the industry. The CMO of the largest advertiser in the world, Procter& Gamble, clearly expressed this concern a few weeks ago. The Chairman of the largest media buyer in the world, GroupM, has also called out this same concern. Meanwhile, the industry is aggressively pushing to keep the bar as low as possible, while cloaking the rapidly increasing level of tracking in darkness. This is happening through policy, as much of industry pushes to remove the FCC privacy rules on ISPs. It’s also happening through technology, as tracking has moved into digital fingerprinting and server to server sharing of browsing history. I know many people want to ignore it, but what if data leakage in the ad tech ecosystem is actually the common thread across the performance, security, transparency and consumer privacy issues that have resulted in a loss of consumer trust and rising ad block usage? There are both industry advocates and executives who make this argument. Facebook has opted to engage in a tech arms race against the very same engineers who are paid by the ad block whitelisting program. Facebook continues to fight a desktop war against ad blockers by circumventing the technology. Almost all of Facebook’s ad revenue growth on desktop came as a result of this tech hacking, according to their CFO during their earnings call. In mobile, Facebook is aggressively shifting content experiences away from the open web, reportedly even ignoring their browser experience, so that they can keep consumers in their app and fight back against ad blockers. Who is monitoring this? Who owns the number two blocker, Ad Block? At the very least, it’s dubious that a company with undisclosed ownership can block this much advertising. At the worst, it’s a clear-cut antitrust or national security issue to have that much control in the hands of an unknown actor. Can no one solve this riddle? In the face of this uncertainty and looming unanswered questions, industry leaders need to refocus on meeting the underlying consumer needs. Yes, many articles have been written and many committees created. However, I challenge the industry to work with us, to dig deeper into the dynamics of ad blocking. As much as you might want to believe ad blocking to be a 2015 meme that’s now under control, that is entirely incorrect. Sitting idle while one company, whether it be Ad Block Plus or Google, controls much of the current future ecosystem could be the most dangerous failure of the Internet yet. Ad blocking continues to be a serious threat to digital media. A new report by PageFair estimates that more than 600 million devices are now blocking ads worldwide. Ad blocking usage grew by 108 million to 380 million mobile devices and by 34 million to 236 million active desktops from December 2015 to December 2016. Interestingly, ad block usage on desktop browsers continues to grow despite the decline in overall desktop usage. Year-over-year global growth for all devices now represents 30%. Why are consumers using ad blockers? Two of the top reasons for consumers installing ad blocking software include virus/malware concerns (30%) and interruptive ad formats (29%). It is important to note that over 70% of users chose more than one reason as “most important” in their choice to use ad block software. How are consumers learning about ad blocking? Word of mouth still leads in overall ad block conversions. Just less than one-third (32%) of ad block users report they learned about the software from a friend, colleague, or family member. An additional 28% learned about ad block software from the internet, news, or media. 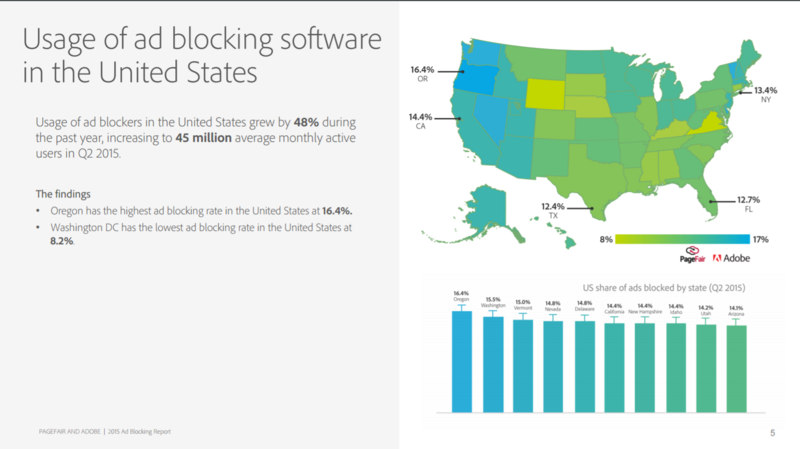 Ad blocking usage is the U.S is becoming more mainstream. Usage still skews male with 20% of U.S. males using ad blocking software compared to 15% of females. Across all age groups, bachelor’s degree attainment was 45% among ad block users surveyed, versus 30% per the US Census. Ad block users in the US are 1.5x as likely to have a bachelor’s degree than the average American adult. How do consumers react to ad block walls? Nine in 10 ad block users report they have encountered an ad block wall (site will not allow access unless the ad blocking tool is disable) while using the internet. A full 74% of ad block users stated that they leave a website(s) after they encounter an ad block wall. It appears that ad block walls do not persuade users to turn off their ad blocker, even if only for brief time. However it is possible websites with highly unique and valued content that is not easily obtainable elsewhere may see a benefit to the use of ad block walls. What are the most annoying ad formats? Overall, over three-quarter (77%) of ad block users reported that they found some ads acceptable. Over half (52%) of ad blockers users preferred static banner while 35% prefer skippable video ads. 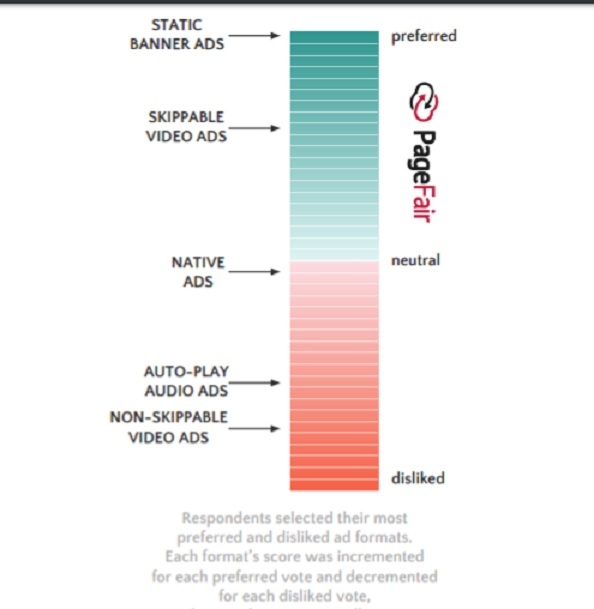 In terms of most disliked ads, both non-skippable video ads (31%) and auto-play ads (23%) ranked highest. Consumers are no longer passive and have taken control of their browsers and—wherever possible—their online experience. Across the board, forecasts are consistent with PageFair’s findings and show ad blocking will continue to grow in the U.S, particularly if ad-blocking software is preinstalled on devices in the marketplace. Could in-image ads be an answer to ad blockers? With increasing competition across various verticals, digital brands are always looking for ways to engage potential customers. However, the average online consumer often feels bombarded with ads and intrusive pop-ups on both their desktop and mobile screens. Tech savvy users simply download ad blockers to streamline their internet browsing experience, a move that has been increasing in popularity in recent years. According to a report conducted by ad-recovery startup PageFair, “The number of consumers using ad blockers in the U.S. increased 48 percent during the last year,” referring to 2014-2015, which resulted in a loss of more than $20 billion in advertisement revenue for publishers on desktop computers alone. ads. Publishers must act in order to tackle the reasons why they are “blocking ads and tailor their messaging accordingly,” according to the head of Condé Nast’s Food Innovation Group’s Eric Gillin. Meanwhile, Mike Hofman, Executive Digital Director of GQ claims that people are increasingly looking to control the time they spent on a website, which provides a challenging environment for ads to sprout across screens. But one of the newer and more innovative monetization solutions for publishers directly helps them meet the needs and demands of both advertisers and users, namely in-image advertising technology. According to Optimind Technology Solutions, “Articles with images get 94% more views,” and this technology could help address the challenge posed by adblockers, as it addresses personalization and relevance, as well as engagement. Based on user behavior and contextual analysis, it provides users with a more natural exposure to advertisements rather than an impersonal and intrusive experience. The reason that in-image ads can be very effective is because they are superimposed over prominent images on web pages that attract the most attention from users. Because in-image ads are personalized for their audience, they are typically more relevant to what the audience members are interested in. 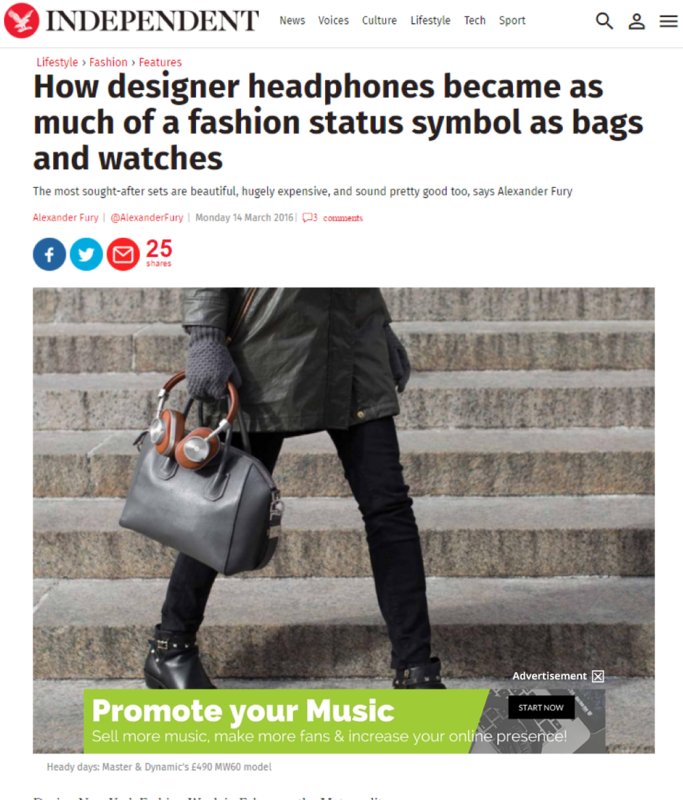 In turn, this means these ads are far less disruptive than traditional display ads and more engaging. As such, in-image ads provide users with a natural experience and highly targeted ads, thus reducing the incentive to even download ad blockers. Below is an example advertisement on a publisher’s website from a leading in-image ad platform Imonomy. It offers a more compelling option to users as well as to advertisers. Additionally, by exposing users to highly engaging and contextually-relevant images, such technology increases ad viewability and provides additional monetization opportunities (for instance, by triggering CTRs) for publishers. While the world of advertising will always be a complex business, publishers will need to play a major role in bridging the gap between advertisers and tech savvy users that are always short on time. To help in this process of countering adblocking technology, publishers need to focus on improving the user experience by providing an added value for both users as well as advertisers. For instance, by encouraging users to continue with the browsing experience in the most natural way, while simultaneously exposing them to advertisements that are cleverly embedded as in-article images, publishers can meet the needs of all parties, while creating additional monetization channels resulting from improved viewability.